If you saw the season-ending episode of Monk, do you remember the clue that helped catch the killer? In the recent thriller Fractured, what was the mistake Anthony Hopkins made that proved he killed his wife? My point–and I do have one–is that often writers think the most important aspect of a good mystery is the ingenuity of the crime, the unraveling of the clues. Which is why many writers are scared to death of even trying to write a mystery or thriller. 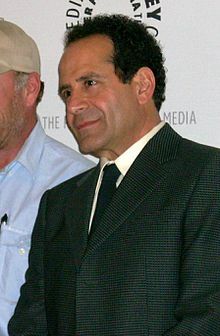 Actor Tony Shaloub, aka "Monk." Yes, viewers of mysteries and thrillers like tightly plotted narratives, clever red herrings, and a certain element of surprise. And you should always strive to weave as many of these aspects into your whodunnit or crime story as possible. Let’s start with the basics: what is a mystery? In simplest terms, it’s a story about the disruption of the social order. A crime against society is committed–a man is murdered, a bank is robbed, whatever. We, the viewer, want to know two things: who did it, and why. At least that’s what we think we want. What do we really want? We want order restored. We want the violator of the social compact–the killer, the thief, the blackmailer–caught, so that things in our world are set right once more. And who do we want to do this? Our surrogate, the smarter, wittier, and more doggedly determined version of ourselves: the detective hero. Whether a street wise cop like Popeye Doyle in the French Connection, a sloppy homicide detective like TV’s Columbo, or a tea-drinking, sweater-knitting old lady like Miss Marple, we want this one thing from our mystery protagonist above all others: we want order restored. But not just social order; the best mysteries, whether on Without A Trace or in Murder On the Orient Express, are also about the exploration and resolution of psychological tension. In other words, how do the characters interact? What do they want? For example, in most mysteries, whether a suspect is guilty of the crime or not, he or she invariably has a secret. A clandestine relationship, a trauma from the past that haunts them still, perhaps even a connection with the killer (or the victim) that helps complete an entire mosaic of possible motives, entanglements and intrigue. Henry James famously said: “Plot is characters under stress.” Well, nothing ramps up the stress level of a group of characters like the murder of one among them. A further “turn of the screw” results when the murder comes under investigation by an outside agent–the hero or heroine, the cop or private eye–determined to ferret out the truth. How does that apply to the mystery you’re trying to write? A reasonable question. Remember what it felt like when some kid broke a window at school and the principal gathered you and all your classmates together? Remember the mounting tension as the principal went down the line, interrogating each of you, sometimes even feigning humor or sympathy, but always with the relentless, eagle-eyed determination of a predator searching for his prey? Well, do the characters in your mystery or crime story feel that way? How do they show it, to the camera, to each other, and to the detective? Or, perhaps more importantly, how do they attempt to conceal it? In most memorable mysteries, or in the best straight-ahead thrillers, this context of mutual suspicion and misdirection of motives is pivotal. It’s what keeps the suspense mounting for the viewer. Moreover, it’s the crucial element that keeps the laying-in of necessary clues from seeming like a mere litany of exposition. By the time we’re halfway through the film Who’s Killing the Great Chefs of Europe?, the lies told and attitudes expressed by the suspects has us convinced that pretty much anyone could be the culprit. Which is exactly what you, the mystery writer, wants most of all. Another important aspect of these types of films, as vital as that of the deceptive nature of the suspects, is the world the story inhabits. All renowned mysteries–from Laura to Twin Peaks to Witness for the Prosecution–take place in a specific arena of life. The design industry, the rainy Pacific Northwest, the be-wigged world of British courtrooms. Whatever. If you consider a film like All the President’s Men a mystery–and I do, since it meets all the criteria–then the fascinating world of Washington politics is the backdrop. Recall, too, how the key to Columbo’s success was the interaction of our rumpled hero with the nuances of the various worlds into which he ventured–from that of classical music to computer science, from Hollywood studios to military schools. His comfortable, familiar character was our vehicle of entry into the specifics of each of these very particular ways of life. But what does all the above have to do with you, and the mystery you’re writing? Let’s see if we can break it down. First, let’s look at your protagonist. And here’s where many new mystery writers get discouraged, and for a very understandable reason. When it comes to the hero–whether hard-boiled private eye or spinster librarian, cop-turned-lawyer or criminal-turned-cop–they’ve all been done. How do you make your sleuth unique? For me, there’s only one answer: ask yourself, what makes you unique? What scares you, interests you, makes you angry? What do you yearn for, or wish to avoid? What are your hobbies, passions? What’s the aspect of your own character about which you’re most conflicted, unhappy, even embarrassed? Believe it or not, this is where the seeds of an interesting, unusual protagonist are first sewn. This concept operates as well for TV and film as for prose. Many writers of popular crime shows and recent thriller movies are patients in my private practice, and I’ve witnessed first-hand how their own issues, prejudices and concerns are woven into their on-screen characters. Next, let’s look at the world of your mystery story. What is the world you inhabit? Suburban soccer mom or single father? Former football coach, magazine editor, or Rhodes scholar? Travel agent, computer specialist, or kindergarten teacher? After all, you know the details of your particular world so clearly. You know the ins and outs. It’s those details that create the backdrop for the crime, that make possible the intrigue, the collision of misleading, back-stabbing, or too-good-to-be-true characters. Think of the gambling background in the movie Ocean’s 11. Or that of the legal profession in The Firm. Why is the background so important? Aside from being crucial to our sense of the reality of the story, and presenting us with a view of a world with which we may be unfamiliar (or that we think we know, but in fact really don’t), a particular arena provides valuable help to the writer when it comes to building narrative and planting clues. How? To put it simply, the best clues in a classic mystery involve misdirection. A clue usually seems to point in one direction, when actually, looked at from a different angle, it reveals something else. A typical example is the clue that appears to confirm a certain character’s guilt, when in fact it’s been planted to frame that person. For the writer, trying to develop the narrative and plant significant clues along the way, it’s much easier (and, I think, more organic) if the clues emerge from the world of the story. For example, if the bad guy uses some antique pistol to commit the crime, I’m much more likely to believe it in a story set behind the scenes at Colonial Williamsburg. I’m stressing the use of a vivid background and the investment in character development for two reasons. And second, because of the happy fact that most good mysteries only have two or three pertinent clues in them anyway. This is really important. Most new writers of mysteries seem to think the plot has to be filled with clues. It doesn’t. One or two gems–the misleading planted evidence, the comment a suspect makes that belies his alibi–are all you need to put the villain away. Or all your hero or heroine needs. Okay, let’s wrap this up. The three things to keep in mind when writing mysteries are: 1) establishing the unique character of the protagonist, 2) making narrative use of the world in which the story takes place, and 3) planting clues (remember, only a few) that derive from the particular aspects of that world. I was blown away years ago when I learned that after famed psychologist Carl Jung broke with his mentor Sigmund Freud, Jung founded a clinical journal devoted to “non-Jewish” psychoanalysis. I’m still figuring out a way to weave that painful chapter in the history of psychoanalysis into a mystery story. What’s in your background that you can use? What’s filed away in that mental Rolodex in your head that might serve as the germ of an idea for a mystery? Maybe your grandfather was the first guy in his town to own a car. Or the guy who bought the last Edsel. Maybe your mother tells the story of getting hit on by some dorky guy at a bar who went on to become Chief Justice of the Supreme Court. Everybody has some story, some incident, unique to them and them alone. All a writer has to do is “twist” that story a little bit–the “what-if” that inspires all story-telling–and a mystery emerges. Because, in the end, that’s where all the best stories come from. Life itself.